Mark the "Plesk Migrator" component for installation and complete the procedure following the on-screen instructions. By Reseller. 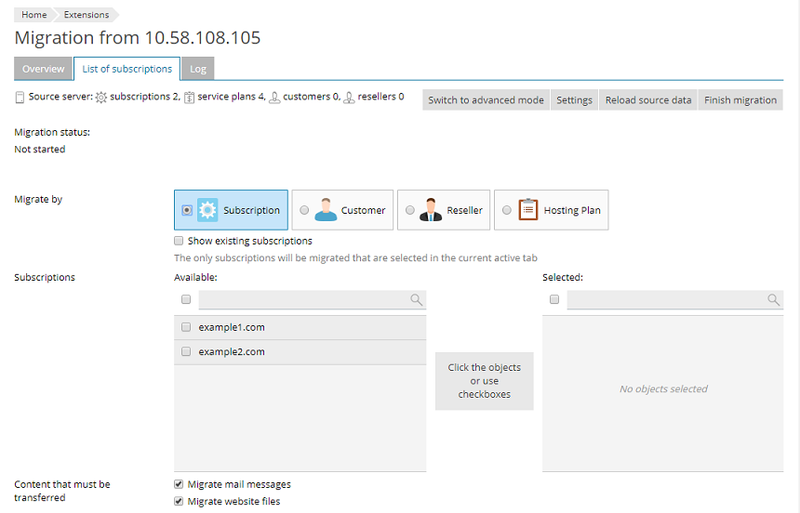 If you migrate a reseller account, all subscriptions owned by the account will be migrated together with the hosting plans they are based on. Note that migrating a reseller account does not automatically migrate the customer accounts owned by the reseller. If you select a reseller account and one or more customer accounts owned by that reseller for migration, the reseller's ownership of the customer accounts will be preserved on the destination server. If you want to perform an additional sync of a subscription's content after the migration is finished, click [Re-sync] next to the subscription's name.